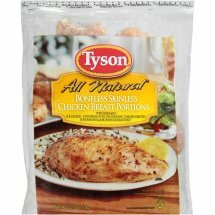 Tyson All Natural Boneless Skinless Chicken Breasts. Contains up to 15% chicken broth, salt, natural flavorings. Chicken raised with no added hormones or steroids**. CHICKEN BROTH, SALT, NATURAL FLAVORINGS.